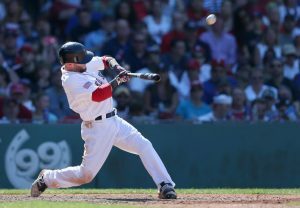 The Boston Red Sox will once again welcome the Texas Rangers for the third and final game of this series Wednesday July 6th, 2016 at historic Fenway Park. The Red Sox took game one beating the Rangers 12-5, as I write this game two is underway and the Rangers are currently tied 2-2 in the top of the 6th. Boston has been struggling as of late, they had a devastating and humiliating 21-2 loss against the Angeles on Saturday but managed to rally back and win the series on Sunday, their first series win in two weeks. Notwithstanding their recent struggles, the Red Sox’s have a strong team, proof of this is that five of its team members are expected to make the roster for the American League’s All Star Game. These include David Ortiz, Mookie Betts, Jackie Bradley Jr. and Xander Bogaerts as well as pitcher Steven Wright who is known for his knuckleball and who is scheduled to start vs. the Rangers tomorrow. Interesting fact is that Mookie Betts who currently has 105 hits and Xander Bogaerts who has 110 hits have become the first Red Sox team mates to reach and/or surpass 105 hits in the first 81 games of the season, an accomplishment that had not been achieved since 1940 when Doc Cramer with 109 hits and Lou Finney also with 109 hits did it. The last time these two teams met back in late June, Texas won two out of three games while they hosted the Red Sox. Historically the Rangers have a quantifiable advantage over the Red Sox, in the last 6 seasons they are 19-31 against them with a run differential of +61 which does not paint a pretty picture for the Boston team who have been struggling to maintain their second spot in the AL East. For the final game of this series, the Rangers will start 25 year-old left hander Venezuelan native Martin Perez, who is 7-4 with an ERA of 3.39 and a WHIP of 1.37. He has not lost a game since May 28th against the Oakland A’s. As mentioned before 31-year-old right hander Steven Wright is set to take the mound for the Red Sox’s. Wright is 9-5 with an impressive 2.42 ERA and a WHIP of 1.19. As impressive as his record is, he failed to win against the Rangers the last time he faced them on June 25th. Given the history between these two teams I have to side with the Texas Rangers to win this game. Remember to visit Ace Sportsbook for the best lines in baseball.